This purifying soap has been specially developed for acne and sensitive skin. For face and body. Alcohol free. The Deep Cleansing Liquid Soap from Macrovita protects the skin against the P. Acnes bacteria, which inhibits sebum production, extinguishes acne and keeps the pores clean. This is THE soap in the fight against acne. Combine with the tonic lotion facial cleanser and enjoy a radiant, smooth and healthy skin. Our liquid olive oil soap against acne has been specially developed for skin that requires more attention. Thanks to the high vitamin E content in the olive oil, the soap stimulates the skin's healing capacity, reducing acne scars, excess sebum and redness in the face. The Deep Cleansing Liquid Soap reduces redness of inflammation, soothes acne and prevents new outbreaks. It helps in the fight against pimples and excess sebum production. Without alcohol, the skin does not dry out and is effective in combating pimples. If you use olive soap on your face, you should usually be careful that your skin does not dry out. This is not the case with the Macrovita olive soap. Thanks to active ingredients such as white tea, provitamin B5 and wheat germ oil, the skin is nourished and the moisture is not withdrawn from your face. Our olive soap for face, neck and decolléte; is even suitable for sensitive areas such as under the eyes. An organic olive soap for sensitive and irritated skin; the ultimate step to calm skin. Use: Apply to a moist face and massage into the skin with upward movements for one minute. Enjoy the subtle facial massage and then rinse thoroughly. Pat dry with a soft cloth. Free of parabens, mineral oil (paraffine, vaseline, petrolatum), silicones, propylene glycol and genetically modified organisms. 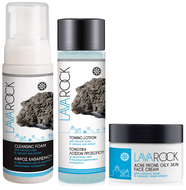 The complete set against acne, pimples and oily skin. Nourishes, works antibacterial and ensures that pimples disappear and the skin becomes calm.